This month I turn 26 (*gasp*) and the day is quickly approaching next week. While I whole-heartedly prefer enjoying birthday experiences over receiving material gifts, I thought it’d be fun to include just a few items that have been on my wish list that I wouldn’t mind showing up in the mail. Just a little something to distract myself from my impending quarter life crisis. 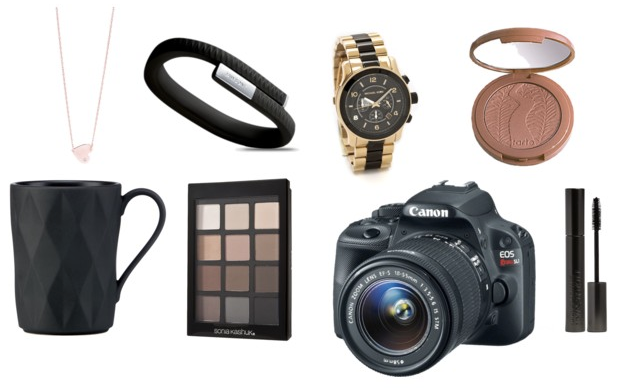 I will more likely than not buy all these things for myself next week. This is your fair warning, American Express! First and foremost, I will be upgrading to a DSLR very soon and I think the Canon EOS Rebel SL1 is the camera for me: it’s compact, light, and has all the bells and whistles this amateur blogger and vlogger will ever need. While it lacks a pivoting viewfinder, I do most of my vlogging with a secondary screen nearby that can be set up should I need to fiddle with settings while sitting on the other side of the lens. I know this is an expensive toy that will last me years and years to come. Another gadget I’ve been lusting after recently is the Jawbone UP. While I’m no fitness junkie, I do walk a least a mile each day so it’d be interesting to sync up that activity data with MyFitnessPal, the mobile app I’m using to log all my meals and weigh-ins. Plus, this is a seriously chic piece of wearable tech! No birthday is complete without a little pampering. While I have a spa day planned but still yet to be reserved, I wouldn’t mind getting a few new makeup goodies I’ve been holding back on for a while. This Sonia Kashuk matte eyeshadow palette is something I could get everyday use out of and it’s super affordable. I haven’t indulged in a high end mascara in a while, so now might be an appropriate time to get my paws on the Armani Eyes to Kill which I’ve been eyeing since fall 2011. Lastly, everyone I know who has the Tarte Exposed blush can’t put it down, and it’s the display I default wander to inside Sephora, so I might grab that myself when I stop in Sephora for my annual Beauty Insider free birthday gift. It was only one year ago when I bought my first Michael Kors Runway watch, on my last birthday. And that watch deserves a companion. Gold has grown on me this year, and I think this two tone Michael Kors Runway watch will be the next addition to my timepiece collection. As an homage to my rose gold MK Runway watch I bought last year, I would love to get another classic jewelry piece that I could wear with it like this dainty rose gold necklace by Jennifer Zeuner. The 1/2″ heart pendant contains a tiny 0.02 carat diamond, all hung on a delicate vermeil chain. It’s beautiful and understated; something I’ll get a ton of wear out of. Perhaps a more practical wish list item is that I need a new mug for the office. I love the unexpected masculine and angular style of this one by kate spade, and it’s something none of my coworkeres would mistakenly pick up. I drink coffee and tea all day at work, so this item will get a lot of use. In addition to my personal “spa day”, I’ve got plans to hit up the beach, State Fair, and brunch with friends. This may or may not include some wine tasting, macarons, and more shopping as well. What did you do on your most recent birthday? Please tell me in a comment below!